In 1854 the Illinois Central Railroad entered Champaign County. At the time only 480 families lived in the County. The city of Champaign did not yet exist. The railroad would play a defining role in shaping the county and the county's growing African-American population. Paralleling the railroad tracks, the North First Street business district, which included not only North First Street but also North Water Street and Main Street east of the train-tracks, would become the new City of Champaign's first downtown. 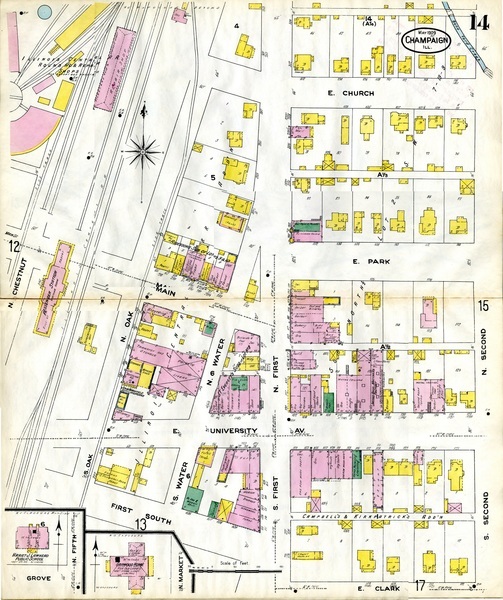 The city's first City Directory (a precursor of the phone book that listed individuals, their addresses, and their places of employment) reveals that by 1878 at least six African-American individuals lived or worked in the North First Street area, with four clustered on the block between University and Main, First and Water. By the early 1900's a small but growing number of African-American owned businesses had taken root in the area. Erma Bridgwater, born in 1913, remembered especially the Harris and Dixon Taxi Cab Company, which was run by Warren Henry and Mr. Dixon, both African-American, at the corner of North First and Main. The taxi company catered especially to females who traveled daily to the University of Illinois to serve as cooks on the campus. Other early African-American businesses in the North First Street area include a brief theatre, which formed in response to the discriminatory practices of the white owned theatres on the other side of the railroad tracks. This theatre appears to have only existed for a few years in the 1910s before going bankrupt. The neighborhood was not strictly commercial, but also housed a number of residences. 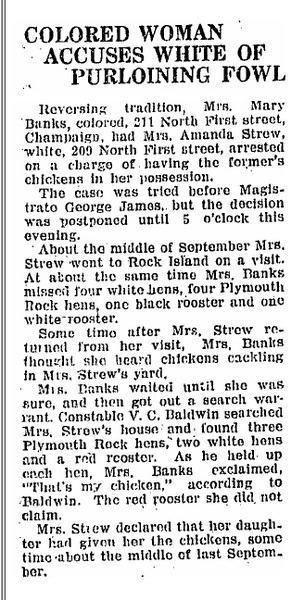 The Urbana Courier records a humorous case in which an African-American woman, Mary Banks, who lived at 211 North First Street, accused her white neighbor, Amanda Strew, 209 North First Street, of stealing one of her chickens on February 19, 1924. Strew settled with Banks out of court. "At one time there was not a single black business on First Street. As the white business owners pulled out, the blacks pulled in."